Are the speed test reliable? I have been on Sky max now for a month and have seen that my line is capped to 8meg. However looking at the ADSL 2 test on the skyuser site entering the noise of 33db it says I should be on 12meg-14meg. I called sky tonight to see what was going on and they said that there is nothing they can do as it's the most my line can do. I pushed a bit as I did not want to take an answer that quick and was told the call will be passed to the second line for further test and someone will call me within 72hours. I was wonder if anyone else has had experience with this and what I should do if they say no again, as I understand it 8meg is the ADSL MAX but being on the LLU I should be ok upto 16meg? Any help, advice would be appreciated. 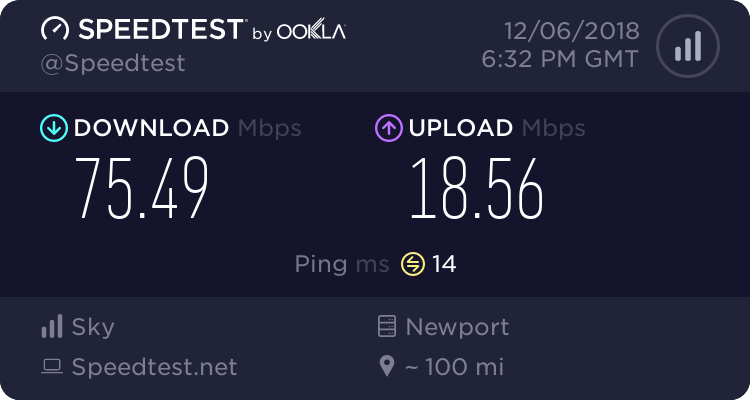 Re: Are the speed test reliable? you need to post your full detailed router stats using mognuts util (see my sig) for us to really be able to comment. Thanks for the quick response, is this what you mean? Your stats look perfect. YOu need Sky to move you from g.dmt to ADSL2+ to get the faster speeds. To paraphrase 'Saturday' tell sky you had an earlier problem which you have now fixed and therefore they can remove the cap and out you on adsl2+. If you do find that your line become unstable, then you can artificially cap your self or even move yourself back to g.dmt without sky's help thus leaving you in full control of your connection. Thanks for the info on this. Bit suprised they don't put you on the fast one to start with as im paying for it but will give them a call tomorrow and see what they say. It could well be that from their tests your line is stable at 8Mb, but shows signes of being unstable at higher speeds. however as i say, you can use mognuts util to manage your connection and cap yourslef and change modes. Just thought i would provide an update, I have just spoken to Sky again about this and they tell me that my line is now set to 11meg. However, looking at the log file below it has increased a bit but still sayd d.gmt, I would have thought this would go to ADSL2+? He said it might take a while to sync (and adviced I look at this site for advice! ).